After three years of steady releases, for some reason the BFI suspended their Flipside series last May. Now, after an eleven month break, they’ve released two new titles, as unexpected as anything which has come before. 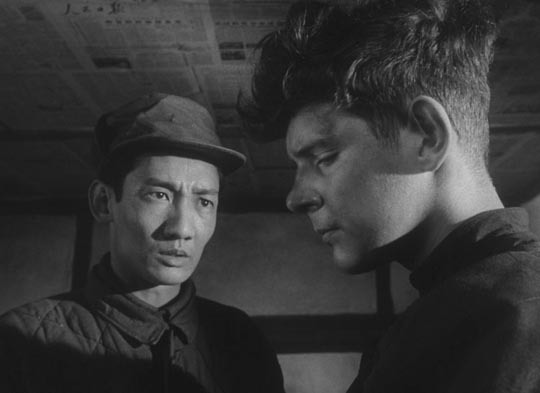 In John Krish, they’ve returned to a filmmaker familiar from a number of previous BFI releases, while in B.S. Johnson, a novelist and poet who briefly turned to film in the late ’60s before his death by suicide in 1973 at the age of 40, they’ve introduced a strange, eclectic and at least to me previously unknown talent. John Krish was a highly respected documentarian with a fine eye for social detail and an interest in the processes of change Britain was going through in the two decades following World War Two. The BFI has previously released a collection of his films under the title A Day In the Life, and a film he made for the Children’s Film Foundation in 1958, The Salvage Gang, is included on one of their recent collections devoted to the CFF called London Tales: although that short feature initially struggles with the overdetermined problems of a group of kids trying to raise money to replace the saw belonging to one of their fathers which they broke, the second half, as the kids wheel a brass bedstead halfway across London, becomes a fascinating portrait of the city still in the process of post-war reconstruction. The new Flipside disk presents something which seems atypical for Krish. 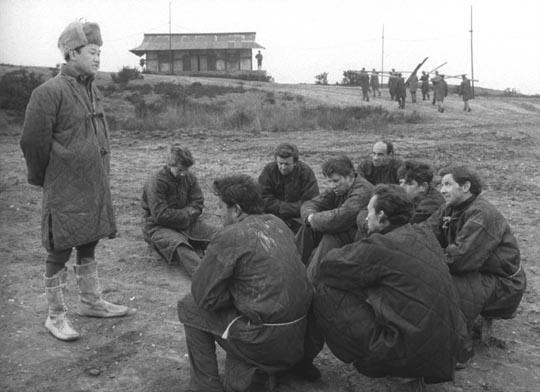 Produced by the military as a training film for soldiers to illustrate the treatment they could expect if taken prisoner by the enemies of freedom, Captured was viewed by the filmmaker as an opportunity to display his abilities as a director of drama, and not just documentary. 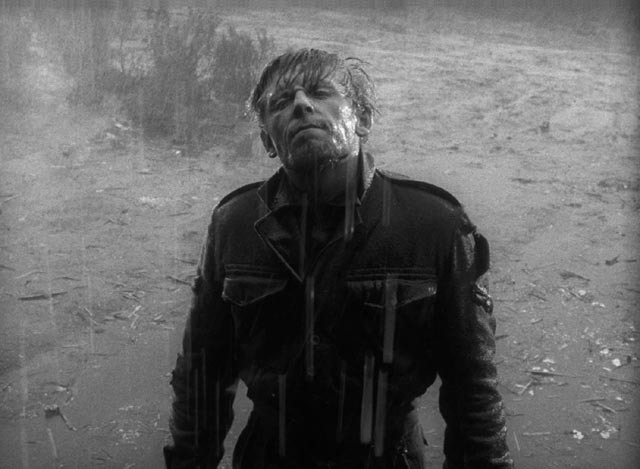 But while it does reveal him as a capable dramatic filmmaker, as it turned out it didn’t help him make the transition because the film never made its way to a general audience; it was restricted to military audiences until this current release. Seen all these years later, it may seem strange that it suffered such a fate as, in terms of its content, it appears quite familiar and conventional. 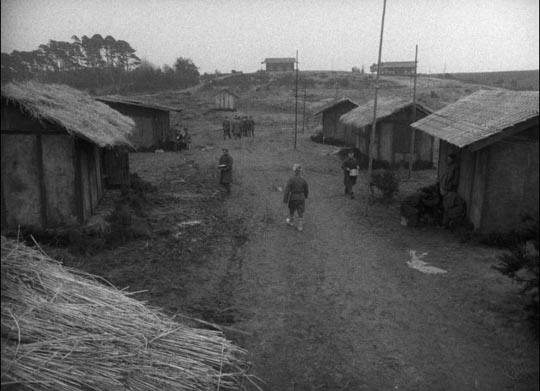 Krish’s brief was to show the techniques used by the Chinese during the Korean War, which had ended just six years earlier. 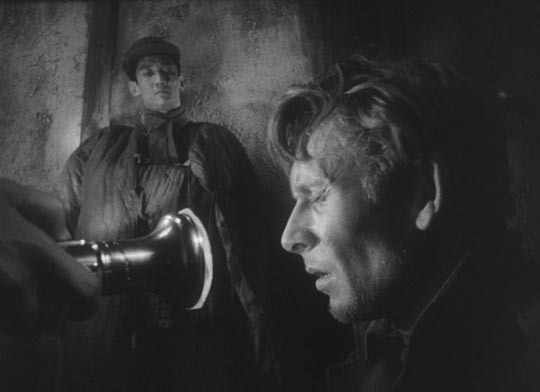 Shot in a bleak area of England in stark black and white, Captured follows the fate of several British soldiers who are taken prisoner by the communists and subjected to a variety of psychological techniques to “re-educate” them and make them see the errors inherent in the capitalist democratic world view. Those techniques include generating distrust among the prisoners to increase a sense of reliance on their captors, as well as isolation, starvation, the use of stress positions and sleep deprivation … even a graphic depiction of waterboarding … in fact, pretty much everything we’ve become so familiar with in the U.S.’s treatment of supposed terrorists over the past decade – although all of this is clearly presented in the film as torture and a violation of international law. The film is tense and well-crafted … but it’s hard to see now what the military restrictions were all about; it works efficiently just like any number of other prisoner-of-war movies from the period and there’s nothing particularly shocking about what’s depicted (Val Guest’s Hammer production The Camp On Blood Island, made the previous year, is in many ways far more disturbing). 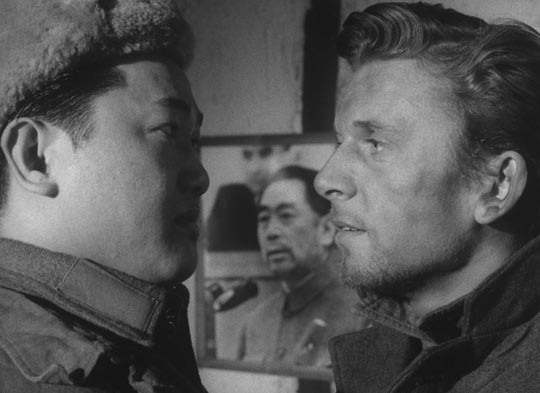 In fact the clear anti-communist stance of the drama would have made it a perfectly viable piece of propaganda during the war itself. Although Krish did eventually make a handful of features, and directed some episodic television (including several episodes of The Avengers and The Saint), he continued to make documentaries into the ’70s, the most substantial of which is included on the Flipside disk. H.M.P. is a one-hour film made for the Central Office of Information in an effort to increase recruitment for the prison service, which was having a hard time attracting new guards. The original commission asked only for a film tour of a prison, but Krish builds the project around three men undergoing orientation, focusing on the kinds of personality needed for this highly specialized work. It’s a fascinating glimpse of what it means, and what it costs psychologically, to keep other people penned up for years. The disk also includes his remarkable safety film The Finishing Line, made for British Transport Films in 1977, previously available on Volume 7 of the BFI’s series of BTF releases. Now, if only Flipside would release Krish’s rare low-budget sci-fi feature Unearthly Stranger (1964)! Not knowing anything about B.S. Johnson (other than having seen some bad reviews of a 2000 adaptation of his novel Christie Malry’s Own Double-Entry), I had no idea what to expect from You’re Human Like the Rest of Them, the Flipside collection of a number of experimental shorts and documentaries the writer made from 1967 to just before his death six years later. The impression you get from these films is of a restless mind which blended a passion for words and language with an occasionally dark view of life. 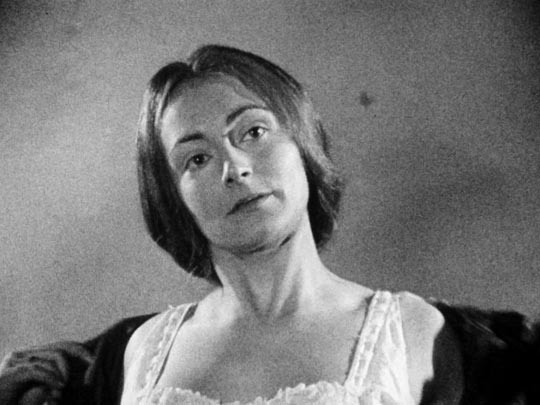 Johnson’s first film, which gives the collection its title, was made with money from the BFI production fund (and the active assistance of filmmaker Bruce Beresford, who a few years later launched a major career as part of the Australian new wave, and later in Hollywood), based on a script which began as a poem, and evolved as a theatre piece before becoming an award-winning short film. 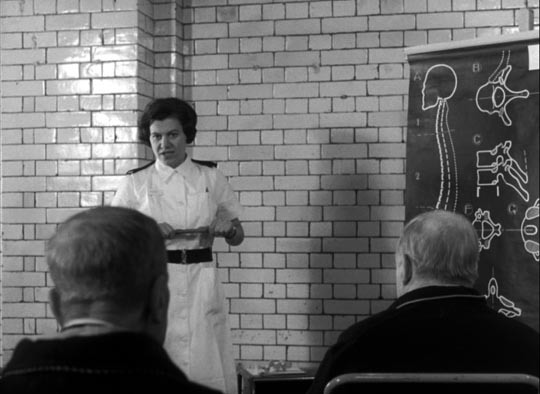 We first meet Haaken, a secondary school teacher (played by William Hoyland, an actor whom Johnson would collaborate with repeatedly in subsequent films), at a lecture in a hospital during which a nurse explains the limitations of the spine to a roomful of old men dealing with back injuries. As her explanations raise questions about inherent problems with the body’s “design” and just who or what did the designing, Haaken is awoken to a sense of his own mortality, the inevitability of decay and death; and back at the school he tries passionately to convey this bleak vision to a class full of bored boys whom he accuses of choosing illusion over reality while declaring his own determination not to submit quietly to the inevitable. 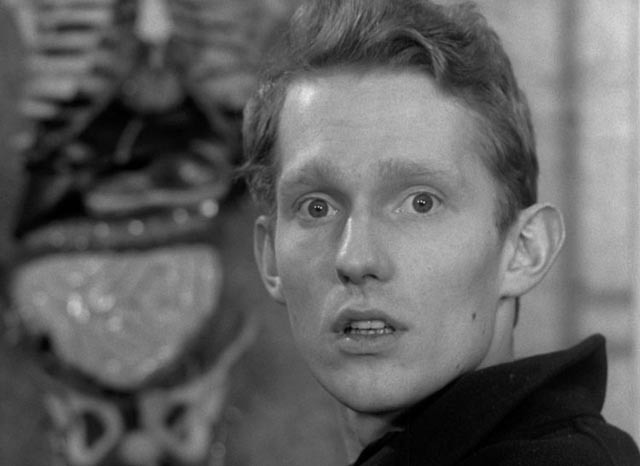 Johnson displays a remarkable control of the medium, editing the film to the rhythms of Haaken’s monologues, cinematographer David Muir’s crisp black and white images providing a visual precision which adds considerably to the intensity of Hoyland’s performance. Hoyland returned two years later for Johnson’s most formally rigorous experiment, Paradigm. The performance here is even more remarkable because Johnson invented an entirely new language which is delivered in a series of monologues which seem to collapse progressively as we go from passionate youth in which ideas and emotions spill from the metaphorical figure of “the artist”, through increasing age and a concomitant decline in the ability to express ideas, until we finally arrive at a silent old age, waiting for death. Despite the complete abstraction of the language, Hoyland manages to fill the senseless words with the idea of meaning; we clearly get his emotion, his humour, understand when he’s telling a joke … in light of Johnson’s subsequent suicide, the central idea that only the uncensored young have the power to fully express themselves, with communication becoming more and more difficult as age encroaches, conveys an intense sense of despair. 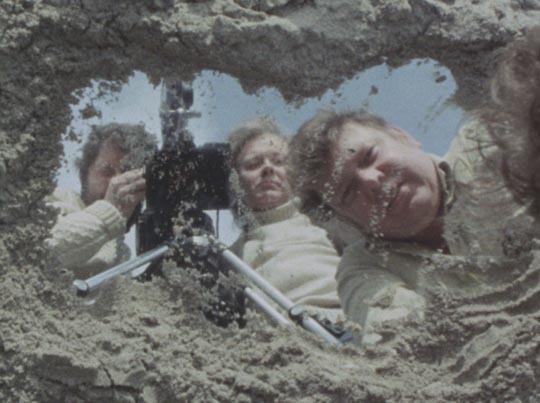 And yet, interestingly, the final film in the set, the 40-minute Fat Man on a Beach (directed for Welsh television by Michael Bakewell), is a leisurely tour of Johnson’s mind conveyed through a monologue delivered on a Welsh beach, ranging over the author’s life and ideas, and filled with visual and verbal wit. 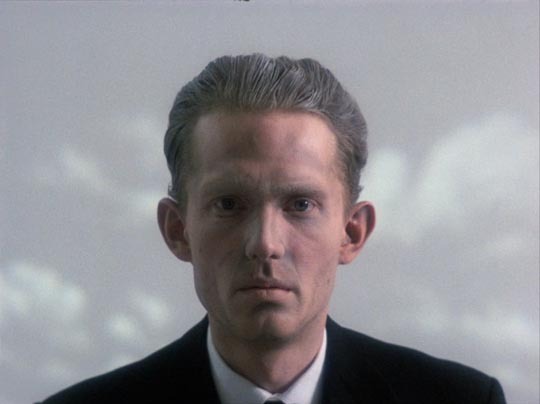 But the lightness of tone can’t quite ward off the chilling effect of the final helicopter shot, pulling up and away as Johnson walks out into the sea; soon after, he committed suicide before the film was edited. 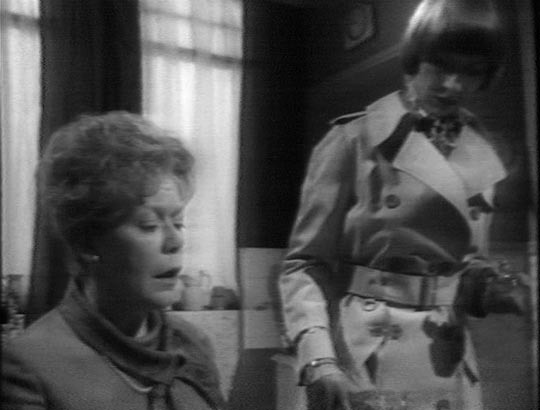 As free-wheeling and experimental as many of these short films are, Johnson was also a politically committed member of the British working class and the two films he made for the Trades Union Council in protest of the Conservative government’s attempts to smash the unions with the Industrial Relations Act of 1971 are unabashed propaganda. Unfair! is a brief satirical depiction of the absurdities inherent in the law, while March! is a documentary account of a massive protest in London, giving the lie to establishment assertions that unions had become “too powerful” by pointing out that some sixty percent of the British population was represented by unions; obviously this attempt (eventually successful) to smash unions was blatantly done to consolidate the power of the capitalist class – today we can clearly see the results of this decades-long political shift all over the western world. An underlying darkness, a sense of despair in conflict with creative energy, runs through this collection. Fear and death hang over the one-minute Poem (which combines bleak imagery with a short despairing verse by Beckett) and the half-hour Not Counting the Savages (directed by a young Mike Newell and surviving only in a very ragged analogue tape copy) presents a nightmarish image of the middle-class family. Johnson’s love of language and word play suffuses his appreciation of Samuel Johnson in a half-hour TV production, and he reveals the way his work is rooted in his own experience with a fifteen-minute exploration of the writing of his experimental novel The Unfortunates. This entry was posted in Review and tagged BFI, Blu-Ray, British Film, British Television, Directors, Docu-drama, Documentary, Experimental Film, Flipside, Review. Bookmark the permalink.